Normally I like to keep my hair care routine as simple as possible but I do like to venture into the unknown from time to time. On this occasion I am venturing into a new hair and scalp range by Pure Potions, which is a brand that was founded on the idea that skin and hair products should be produced with ingredients that are as close to their natural state as possible. Pure Potions have created a extensive range of creams, lotions, and potions which reduce the risk of reaction that can occur with highly processed substances. Now, Pure Potions are pleased and proud to announce the launch of their ultra-natural hair and scalp range, a shampoo and conditioner that are truly mild and gentle but work beautifully to keep hair in clean, shiny, healthy condition, naturally! I am only too excited to be able to have the opportunity to try Pure Potions. I don't know about you but I do feel as if I have tried everything to get my hair looking shiny, healthy and try to eliminate my dry ends. Regular cuts, letting my hair dry naturally and trying every hair care product going to battle these problems. But nothing seems to help well until now. FINALLY! A hair care range that is free from harsh detergents, polluting, additives, synthetic preservatives and potentially irritating chemicals. I have always struggled with my oily roots and dry ends I could even go on to say straw like ends that break so easily. I have tried no end of products to try and nourish my dry ends but these can leave my roots looking very greasy, so greasy that it doesn't always even look as if I wash my hair. It is rather frustrating, as my hair only lasts a day and I am having to wash it every other day, everyone knows that regular washing can create more problems rather that combating them. So when an opportunity to try a new hair care range that is 100% natural that promises to purify roots and hydrate my hair, naturally. First up, we will talk about the Pure Potions natural shampoo with chamomile, nettle and chickweed. I was only too happy to try this as my hair looks so lifeless and dull! As soon as I opened the bottle I was surprised with the scent of the shampoo, it was subtle and in no way overpowering, but I could tell that it was a natural product. This Pure Potions shampoo has been especially formulated for those with dry, sensitive and allergy prone skin by providing a mild and gentle experience. 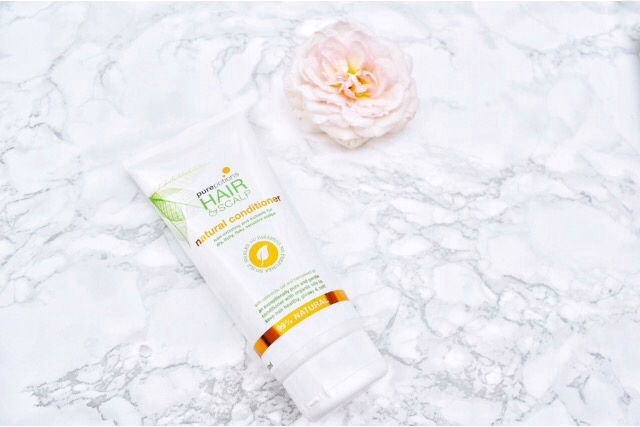 It contains hemp seed oil to feed the scalp with the nutrients it needs to stay strong, shiny, healthy condition, as well as organic with mild hues of nettle, calendula, chamomile and chickweed. Furthermore, this shampoo contains the mildest cleanser that will help to gently lift dirt and grease from the hair without stripping the natural oils. The colour of the shampoo took me be by surprise as it was a vibrant orange and was very thick in consistency, and foamed up well. But due to the fact that the shampoo is a natural product, it didn't foam as much as conventional shampoos. So, I did feel as if I slightly over used the product with the first wash, but I soon got use to the face that it didn't foam up as much as my regular shampoo. As I rinsed there was no form of residue left on my hair but my hair felt cleansed and free from product overuse. The Pure Potions natural conditioner with calendula, oats and hemp seed oil has been designed to try and nourish sensitive scalps with deeply hydrating hemp seed oil along with a blend of calendula, chamonile, nettle and chickweed. I also like the fact that this conditioner has a growth boosting argenine and silky-feeling, nourishing oats. The consistency of the conditioner was very thick and I was a little worried that due to it's thickness it would feel like putting actual light orange coloured grease into my hair. But after leaving the conditioner on for 5-10 minutes, and rinsing I could feel a thin layer of product on my hair. My hair wasn't tangled and my fingers glided through my hair, which never happens with my regular shampoo. Using these two products together left my hair feeling cleansed, but nourished. Pure potions have developed a natural hair care regime for those who want to use only the mildest and gentlest of botanical ingredients on their crowning glory! Kind to skin and kind to the planet, the Natural Shampoo with chamomile and calendula and Natural Conditioner with oats and hemp seed oil are made with gentle plant-based cleansers and ingredients of natural origin such as herbal tinctures, organic oils and plant extracts. They are free from potentially irritating or toxic additives such as perfumes, petrochemicals, parabens or SLS/SLES, so are also suitable for those prone to scalp psoriasis, eczema or dry, itchy, flaky scalps. The range is completed with Scalp Oil with tea-tree, borage and rosemary, which nourishes and conditions itchy, flaky scalps. This 100% natural blend of oils is perfect for overnight application to give your hair a really intensive conditioning treatment and keep your scalp hydrated and healthy. The whole range is so nice to use. I honestly have to say that this is probably one of the best natural hair care products that I have used. These products are kind to the skin and they have definitely left my hair feeling cleaner, softer and smelling gorgeous. I highly recommend using Pure Potions if you love natural hair care products. I just want to say thank you to the Pure Potions team (Jess, in particular) for giving me the opportunity to try some of their amazing products. 2 comments on "Pure Potions Hair and Scalp Range"
You sound similar to me, needing help with dry ends but not wanting the products to make your hair feel greasy or heavy. I have the added problem of having blonde hair which can look dull with some products too. This sounds like a great solution. My hair is so frazzled by bleach and drying that I think I need these products in my life!